The World Health Organization now ranks physical inactivity as 4th largest killer globally, behind obesity. Throughout Canada we continue to sit more at every stage in life; as kids, working adults and in care homes. In the 1960’s over 50% of us had moderate physical activity incorporated in our work places, but today that figure is less than 15%. Modern technology and computer based work has made us more sedentary, though until recently few questioned that technical advance could be negatively impacting our health. Furthermore it turns out that even if you are hitting all your physical activity goals but remain seated 8 or more hours a day you can’t undo the negative effects of too much sitting. Accordingly, we must create ways for all of us to moving more throughout the day. In recent years a new kid has emerged on the science block. That kid is called "Sedentary Behavior", and it’s beginning to get noticed for all the right reasons. Under Canadian workplace law there is no current guidance on how to reduce sitting time in the office. 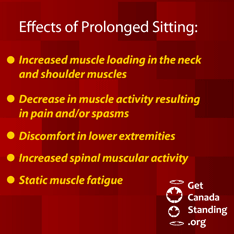 The Government of Canada’s Labour Program notes that prolonged sitting can result in back pain, and suggest minor adjustments (screen and keyboard height, etc) to avoid these issues. But the simple fact is that there is NO correct prolonged sitting position. Our bodies are designed to stand and move for long periods of time. And we automatically shift our weight and move around while standing. Standing initiates key physiological processes and prevents both the repetitive stress and muscle degeneration that is caused by sitting. Typically the act of sitting is rarely viewed as a health and safety concern. 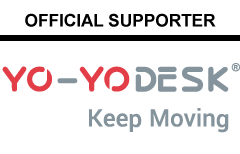 When it is considered the link is limited to Musculoskeletal Disorders (or MSDs) meaning injuries and disorders that affect the human body's movement or musculoskeletal system (i.e. muscles, tendons, ligaments, nerves, discs, blood vessels. "Even if you exercise for at least 30 minutes most days, you are still storing up health problems from being sedentary too much. The message is clear - move more and sit less"